KGPCo is the leading provider of complete, customized, and scalable supply chain and network transformation solutions for the communications industry, whose vision is to be the go-to partner that enables customers to build, optimize and transform their networks. KGPCo is the only large-scale organization that combines a comprehensive suite of technical strategy and implementation services with a national logistics network and portfolio of technology partnerships. 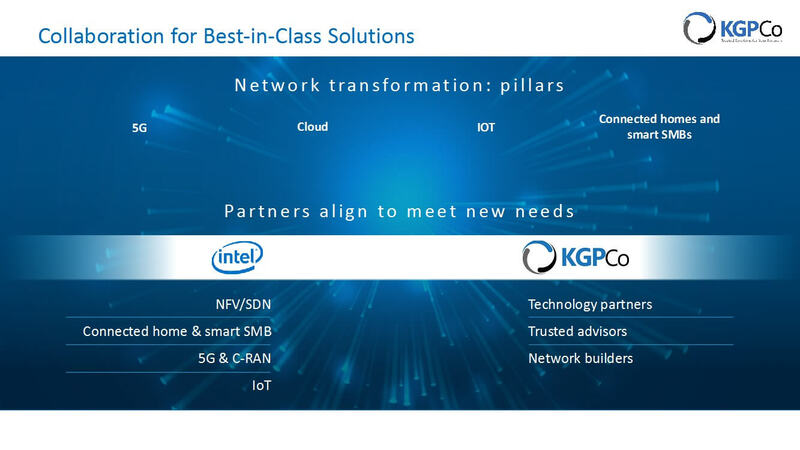 With the addition of the recent launch of the KGPCo Solution Innovation Center to evaluate, design, and engineer cloud and virtualization solutions developed and operationalized in a live network environment, KGPCo is focused on being a trusted partner for customers and providing a single brand that can deliver a complement of network solutions. We are bridging the gap between legacy networks and next generation SDN networks. Defining and building networks that are versatile, agile, scalable and cost effective has become a primary focus for Communications Service Providers. With an influx of competition stemming from non-traditional markets, Service Providers are finding they must shift their strategy towards a software defined network (SDN). Network function virtualization (NFV) and software defined networking (SDN) solutions are transforming the industry. Current roadblocks include legacy proprietary solutions for both hardware and software, the desire to safeguard and control existing infrastructure, and the ability to effectively and efficiently adapt and integrate the new network. SDN and NFV bring new approaches to traditional purchasing models for both hardware and software. Network virtualization integration allows Service Providers to move into the next generation with more flexible, innovative, and cost effective business and customer solutions.